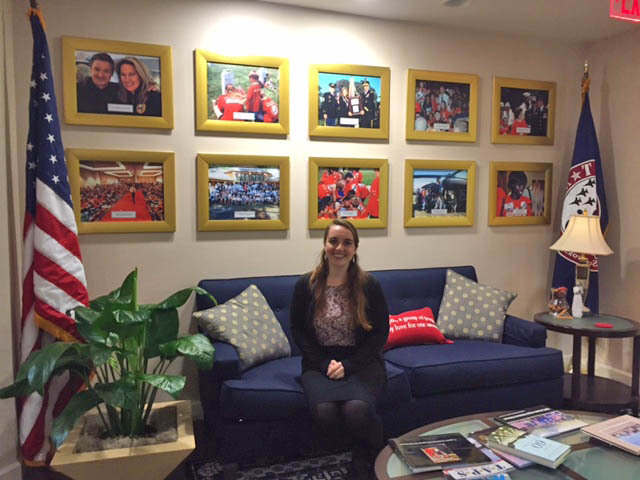 "My internship with TAPS, the Tragedy Assistance Program for Survivors has provided me with guidance and knowledge on so many different levels. TAPS offers compassionate care to all those grieving the death of a military loved one. Peer-based support; casework assistance; connections to grief and trauma resources; and retreats, camps, and national/regional survivor seminars. Every day in the office flies by and the warm, friendly, and welcoming atmosphere of everyone who works here is ever flowing. It is a beautiful feeling to be inspired daily. When I am not in the office I love exploring the city. I created a list of the best places to read in Washington, D.C. and have been slowly checking each off my list. So far I have enjoyed reading in the Botanical Gardens the best. My favorite museum, which I strongly suggest visiting, is the Newseum. It has seven levels and you can easily lose yourself in all the information, pictures, and videos for a full day. What is great about Washington, D.C. is how accessible everything is. Most museums are free and have layers of history embedded in them. It is still so hard to grasp how much history has happened right where I am living. I enjoy going from museum to museum on the weekends. It is also nice food wise. Craving sushi? Burgers? It will be a simple metro or quick walk away. I am used to living in remote area where everything is a drive. I have really enjoyed bouncing around and doing as much as I can because of how simple it is."